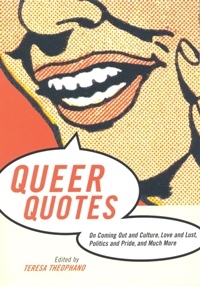 Queer Quotes is a compendium of wit and wisdom from well-known historical and contemporary cultural figures--from Oscar Wilde to Rita Mae Brown, from Quentin Crisp to Sandra Bernhard, and from James Baldwin to k.d.lang. Often amusing, the quotes are also thought-provoking and have an impressive scope. Subjects range from love and gay marriage to HIV/AIDS, from gender identity to religion, and everything in between.